Note: Please include the following in each item you suggest: 1. Item name, 2. Item enchant, 3. Item description. Please also note that one out of the 5-10 items must be fail prize. (Something that is of worse value then its other contents). You may also wish to include what color you want the name of the item to be! Please note that if a color is not named, a random one will be picked by me during creation. Please only suggest vanilla minecraft items (Armor, tools, blocks, heads, etc.) and do NOT suggest modpack items as they are not compatible with the Steve Co. plugin. Thank you for taking time to suggest new crates and items that players can collect and and trade with friends! To keep the post clean, I will be removing quotes and stuff so its just suggestions. Please let me know if you feel something in this post is either wrong or I have left something out. Like playing on our 1.7.10 Server? Enjoy helping people? Interested in a staff or architect position? You're in the right place! We're now accepting both staff and architects on our server. Make sure to read the requirements and rest of the post before applying! You will be contacted within 1 week if you're accepted. If you do not receive a reply and wish to know why you were denied, you may contact any 1.7.10 Manager+ to receive a reason. - In-game perks of some kind? - Forum perks of some kind? - Rewards of different kinds? - The forums to become more of the community? Thanks to @wealthywalnut who contributed to creating this. BBCode stands for Bulletin Board Code and is a lightweight markup language used to format posts. The available tags are usually surrounded with square brackets, such as [ b ]. NOTE: The brackets don't need spaces, its just to show the code. NOTE: When using bbcode the order doesn't matter however the order must match in reverse order. For example if you use bold then italics then you must close italics first followed by bold. [ color=blue ]text[ /color ] is an example. Sizes can be added to your text, this can be used to create smaller messages, or larger ones for titles. The most similar font to default is Arial, although it's not exact. Text Alignment can also be done using BBCode. An example for using these would be in the Staff List, the link to the profile would be the link and the displayed word is the staffs name. Using the link as a link to the rules list and the displayed name as `here` is also a common use in ban appeals. There are some extra thing you can use in BBCode. The code tags create selectable code, this is useful for formats or a way someone can easily copy something. It can go on many lines! One will be shown to separate this section and the next. Tables are a great way to format a post and clean up the layout but they can be tricky to understand at first. Opening and closing a bracket set before writing anything is a great way to minimize problems. Again, for this example, spaces are used so the formatting can be viewed outside of the text editor. NOTE: The formatting as seen above can also be used in a table to further add to the looks of the post. [ table ] declares that everything until the [ /table ] is to be inside the tables. [ td ] and [ /td ] sort the information into appropriate columns. You can make the table with as many rows and columns as can fit. Just be sure that the brackets match from beginning to end. NOTE: Using [ center ][ /center ] around the outside of the table, as seen above, can make the information within the table be centered within its respective column. If you think anything else should be added or anything is wrong please contact myself on discord or forums. 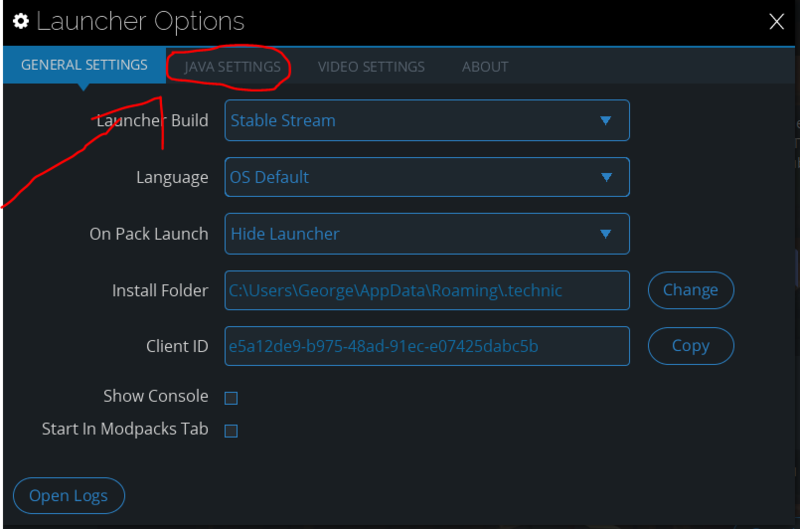 Download the technic launcher from here. 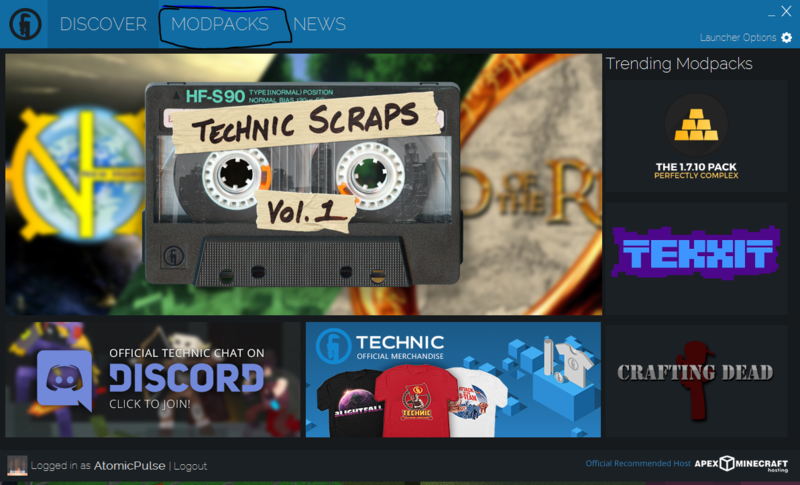 Click "Modpacks" as highlighted in the image. 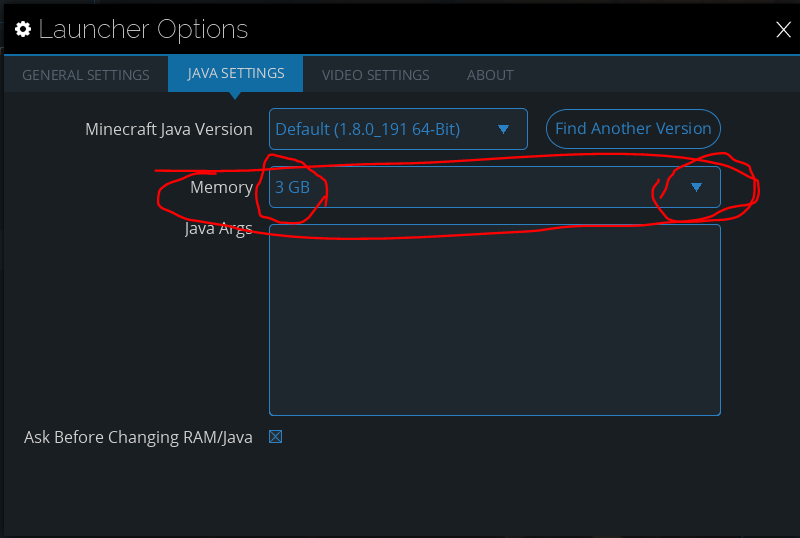 Go to the "Launcher Options"
IF the maximum you can allocate is 1gb then you only have Java 32, in which case download Java 64 bit here. 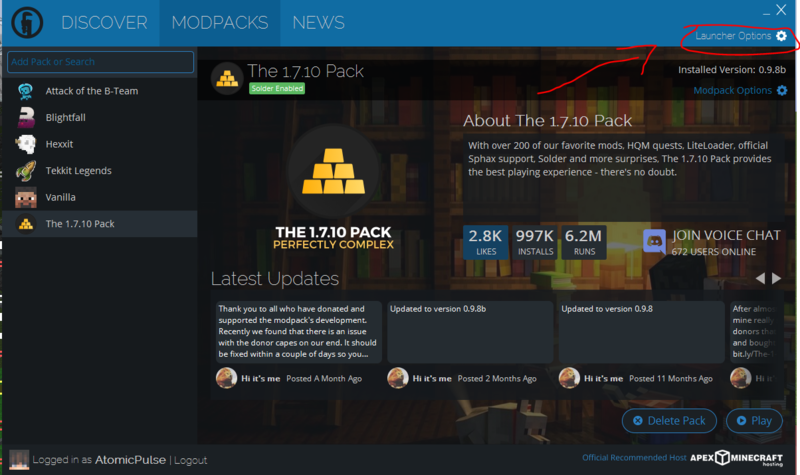 Search for the "The 1.7.10 Pack" on the launcher, it should be the one with lots of gold as the picture. It may also be a good idea to download some extra mods for the pack, eg Optifine & fpsPlus. These can be found here. You're Done! You should now have a working pack and the extra mods! Contact a staff member if you're still having trouble. Please read ahead for rules and how to use the perms! You will be notified if anyone buys anything. You can now purchase AutoShop perms & MarketListing perms! NOTE: The prices of these may change at any time! These are only for now! AutoShop Perms allow you to create playershops, which others can buy/sell items from you, much like the official one at /warp shop. Only difference is, you can list items yourselves on signs (you must have the items). MarketListing Perms allow you to add something for sale on /ml, this will give others the ability to put items up there! To see how to get each rank, look at the ranks guide. /money - Views your money only, you can't pay anyone. /spawn - Takes you to the spawn in the world you are in. /home - Take you to your home. /sethome - Sets your /home. /money - Shows your money. /pay <player name><amount> - Pays money to another player. /pm <recipient> <text> - Send a message to another player. /r <text> - Send a quick message to the most recent player you sent/received a message from. /who - Shows who is online. /warp <warpname> - Teleports you to the warp location. /warp create <warpname> - Creates a /warp. /warp delete <warpname> - Removed a /warp. /warp private <warpname> - Makes a warp that you created private so that only you can warp to it. /warp invite <playername> <warpname> - Makes a player of your choice be able to warp to your private warp. /warp assets - Shows you your own warps. /help - Gives you a book that may help you. /tpa <playername> - Requests a teleport to another player. /tpahere <playername> - Requests a teleport so the player can teleport to you. /tpaccept - Accepts the teleport request. You will receive a kit for each rank you get. You will not need to complete the pocket keys when claiming all keys. BTeam prizes will also not be given due to it shutting down soon so please request for another servers prize. Clues / locations may be given as the event progresses (1 week long). Due to a recent decision from the Owners, W2 will no longer be supporting backups. This means that if the world becomes corrupted, the chance is your base may be removed and gone completely. If you need help with moving your base or other materials, contact a Manager+. In some cases, other staff ranks can help too. Its still un-certain if the world will become corrupted any time soon, but if you want to be safe make sure to move everything you want to W1. The event teams of all servers have been planning a Global SFT Event recently. The event will be based upon the film/book: ReadyPlayerOne. There will be prizes per server for those who cant access the others, and bigger prizes for completing all servers (pocket won't be required). - Teams are to be no more than 3 members. - ALTs (alternative accounts) are NOT allowed. Doing this to potentially receive extra rewards will result in a BAN. Post a reply below with your team members and team name below. Team entries close on Wednsday 31st October as we expect the release of the event to be very soon afterwards. more information regarding the event will be revealed when the event is released. Credit to @TheStarNomad for creating this. Whether you're new to the server, helping someone out or just need some info, this is the place for you! This is just a list of possible fixes, if these do not work you can make a post about your problem. Why can't I craft an item? More than likely the item you're trying to craft is banned. I tried to place an item and it disappeared? Some items need more space to be placed. Normally it is placed back into your inventory and relogging makes it show again. If it doesn't show after relogging then it has glitched out, and you can possibly get a refund from a Manager+. Note: lying to gain items will result in a BAN. How do I stop people from griefing my stuff? 1. Type /pos1 and /pos2 at either corner of where you want your claim. 2. Type /claim to create the claim. All info such as adding members, deleting the claims, list of claims, etc are also displayed by typing /claim or /cm. Claims DONT go from bedrock to sky so you will need to worry about the Y coordinate. My friend can't open any chests or build on my claim! Just type /claim or /cm, this will open the gui which allows you to manage your claim. Who are the staff on this server? Staff are chosen by current staff. To even be considered you must meet the following requirements. You are required to have 75+ hours on the server. Being friendly, helpful and active will increase your chances of being chosen. Someone who has contributed to the server / sft. To build for the server whenever required. An Owner is someone who owns / runs the server. An Admin is someone who has been a worthy staff member and made it to the top staff rank. An Elder is a resigned Admin. A Manager is someone who successfully got promoted from Mod. An Engineer is a resigned Manager. Protect houses, buildings, and property of a player. A Mod is someone who was successfully promoted from JMod. A JMod is someone who was successfully chosen to be staff. B-Team / [BTeam] New Events and Suggestions! Any improvements that you would like to be made to current events. Any improvements that you think could be made to improve events as a whole. Don't be afraid to ask for an event, any staff member is willing to try and host one. Although, avoid asking Managers and Admins as they have less time to do so. Events can be small or big, they could last up to a couple of days! Players can host events in the EventWorld under supervision of an EventHost or EventMod. Don't be afriad to ask. Players can build their own events if they wish! They can run these events without supervision of staff members. (Not in the EventWorld) . Overall, our EventTeam are interested in how we can make events more fun for you, so please leave your ideas / improvements! Birthday Wishes / Happy Birthday Luc! Happy birthday to @mathmatician17 and @Chara88! Happy birthday @Zunix00! Hope you've had/having a great day! Birthday Wishes / Happy Birthday to me! A block/item such as `stone` may be in a post, find the ID of the item(s) and put them together as co-ordinates. Once located the co-ordiantes, go to them in WORLD2. (the order of the co-ordinates should be stated, eg Stone(1) (first co-ords). There you will find your key. You will then need to message AtomicPulse the co-ords and he will give you the password to enter the room. Birthday Wishes / Happy Birthday Dave! Unserious Section / HIRING CAPITAL LETTER POLICE! The disrespectful @theP has broken the capital letter law so we MUST join forces to destroy this monstrosity in SFT.